Well, how about making that hole in one from the roof of the Newport Beach Marriott Hotel – a whopping 16 stories above the green! On March 11, 2012, Hole In One International’s sister company, Odds On Promotions, will write a check for $10,000 to any of the 40 participants who can ace a 119-yard shot from the roof of the Marriott into a hole on the second green of the Newport Beach Country Club. The high-rise hole in one contest, dubbed “Shot From the Top”, benefits the Hoag Hospital Foundation. Adding a giant-prize hole-in-one, putting or golf shootout to your golf tournament is more than an exciting way to raise more money – done right, it’s can be a media magnet. And, as you can see, you can get as creative as you want, because whether it’s from the roof of the clubhouse, the balcony of a nearby condo or hotel tower, the top of your retail location or even from a helicopter… Hole In One International’s sister company, Odds On Promotions, can insure it! Give them a call today at at 888-827-2249 or shoot them an email for more ideas, if you have any questions or to obtain a free, no-obligation quote. 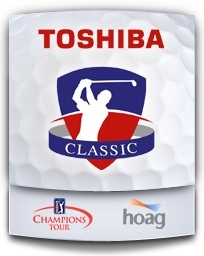 The Toshiba Classic is one of the most exciting weeks of the year in Orange County. For seven days in March, Newport Beach welcomes the legends of the golf world. One of the most successful tournaments in Champions Tour history, the Toshiba Classic has raised over $14 million in the past 14 years for its lead beneficiary Hoag Memorial Hospital Presbyterian as well as other Orange County charities.